Do you have empty printer cartridges that you would like to get recycled in a responsible fashion? Do you want to earn some money for your School, charity or non profit organisation? Cartridge Depot can recycle any printer cartridge free of charge from any business or organisation and will actually offer a donation to schools, charities and non profit organisations in return for certain empty printer cartridges, a recycling service that helps save the environment and earns you money at the same time. If you visit our store to purchase a printer cartridge don’t forget to bring in your empty printer cartridges as they may qualify you for a discount on your purchase. 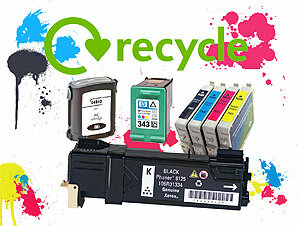 We can recycle any printer cartridge free of charge regardless of it value. You do not have to purchase anything from Cartridge Depot to recycle with us. We can only give money for certain cartridges, cartridges that we give money for do change monthly. If you are an organisation who would like to find out more or would like to arrange a collection of your empty printer cartridges, contact us on 01234 910908 or email us at info@cartridge-depot.co.uk. Contact us to find out more information on which cartridges we can donate/discount money for.